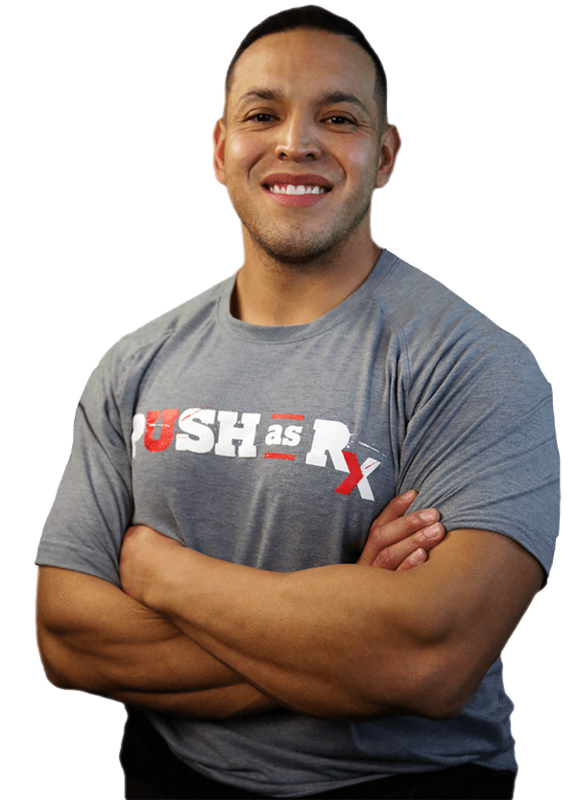 Wellness Chiropractor, Dr. Alexander Jimenez takes a look at discussing nutrition with patients in a clinical setting. 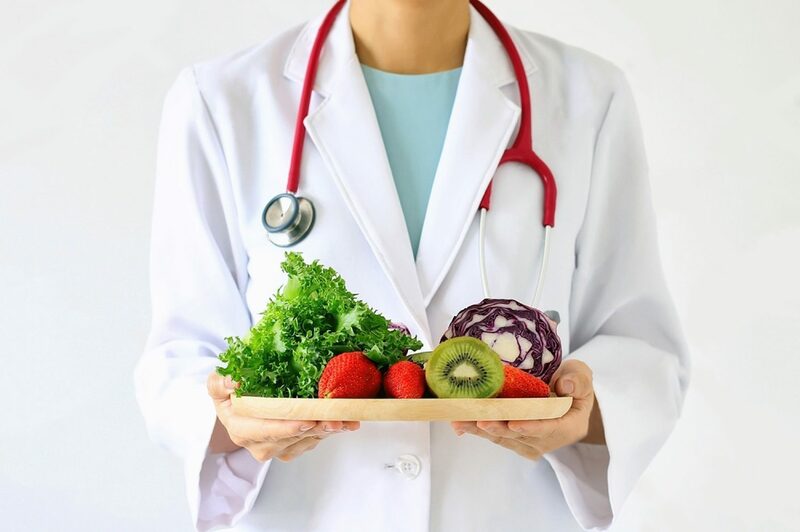 Despite overwhelming evidence that relatively small dietary changes can significantly improve health, clinicians seldom discuss nutrition with their patients. Poor nutritional intake and nutrition-related health conditions, such as cardiovascular disease (CVD), diabetes, obesity, hypertension, and many cancers, are highly prevalent in the United States,1 yet only 12% of office visits include counseling about diet.2 Even among high- risk patients with CVD, diabetes, or hyperlipidemia, only 1 in 5 receive nutrition counseling.2 It is likely that many patients receive most of their nutrition information from other, and often unreliable, sources. Moreover, nutrition and behavioral counseling have traditionally been non-reimbursed services. Few state Medicaid programs cover nutrition or obesity counseling, and before 2012, Medicare explicitly excluded coverage for obesity counseling; although now a reimbursed service for Medicare beneficiaries, just 1% of eligible Medicare beneficiaries receive this counseling.5 Dietitian counseling is also excluded by Medicare, unless patients have diabetes or renal disease. Although the Affordable Care Act mandates coverage for services graded A or B by the US Preventive Services Task Force, including nutrition counseling for patients with CVD risk factors and obesity counseling for patients with a body mass index of 30 or greater, existing private health insurance benefits are in- consistent, and the covered services are often unclear to both clinicians and patients, thereby limiting use. Furthermore, health behavior change counseling is often frustrating given the current food environment, in which less nutritious foods tend to be less expensive, larger portioned, more easily accessible, and more heavily marketed than healthier options, making patient adherence 6 to nutrition advice challenging. Conflicting and confusing nutrition messages from popular books, blogs, and other media further complicate patient decision making. 1. Start the conversation. Several short, validated screen- ing questionnaires are available to quickly assess need for nutrition counseling, such as the Starting the Conversation tool8 (Table). This approach can be efficiently used prior to seeing the patient at an appointment, either delivered by medical assistants as part of vital sign assessment or as prescreening paperwork for patients to complete online or in the waiting room. 2. Structure the encounter. Using methods such as the “5 A’s” (assess, advise, agree, assist, arrange), which has been adapted from tobacco counseling. Motivational interviewing, which has documented efficacy in numerous behavior change settings, is particularly helpful to engage patients who are not yet committed or are hesitant to consider behavioral change. 3. Focus on small steps. Changing lifelong nutrition behaviors can seem overwhelming, but even exceedingly small shifts can have an effect (Table). For example, increasing fruit intake by just 1 serving per day has the estimated potential to reduce cardiovascular mortality risk by 8%, the equivalent of 60 000 fewer deaths annually in the United States and 1.6 million deaths globally.9 Other examples include reducing intake of sugar-sweetened beverages, fast food meals, processed meats, and sweets, while increasing vegetables, legumes, nuts, and whole grains. Emphasize to patients that every food choice is an opportunity to accrue benefits, and even small ones add up. 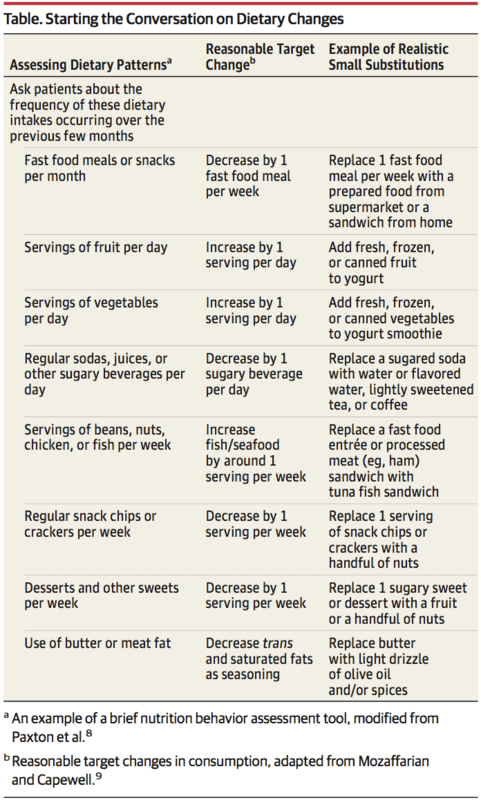 Small substitutions still allow for “treats,” such as replacing potato chips and cheese dip with tortilla chips and salsa, the latter lowering trans fats and saturated fat and increasing whole grain and vegetable intake (Table). 4. Use available resources. Numerous extracurricular resources are readily available for clinicians. The Nutrition in Medicine program offers online, evidence-based nutrition education and tutorials for clinicians and an online, core nutrition curriculum for medical students. The Dietary Guidelines for Americans offers evidence- based and freely available nutrition guidance, tutorials, and tools for clinicians and patients alike. A companion website, Choose My Plate, offers nutrition and counseling advice for clinicians and handy resources for patients, including recently added videos with useful examples of small substitutions that patients will appreciate. 6. Do not do it all alone. The primary care physician need not be the sole clinician who provides nutrition counseling. Proactive use of physician extenders (eg, physician assistants, nurses, medical assistants, and health coaches) and referrals can alleviate much of the burden for the busy clinician. Receptionists can distribute assessment and screening questionnaires for patients to complete in the waiting room; medical assistants can document behavioral change progress while assessing vital signs; administrative staff can identify and con- tact patients who are overdue for interaction. Large practices may benefit from including nutrition or health coaches on staff. Referring to clinical specialists and community-based support programs can significantly extend the clinician’s reach.7 In addition to registered dietitians, numerous clinical and community resources are available and often covered by insurance plans. Board-certified obesity medicine specialists, certified diabetes educators, and physician nutrition specialists are available as referrals in many areas. Diabetes Prevention Program group counseling sessions are now covered by Medicare and available throughout communities, such as in many YMCA sites, and electronically. Although there is no conclusive evidence that these steps will improve diet and health outcomes for patients, there is virtually no harm in counseling and the potential gains, especially at the population level, are substantial. 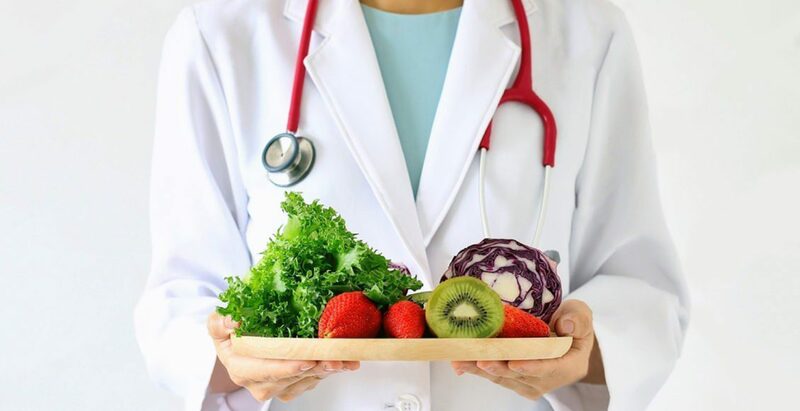 Nutrition and health behavior change must become a core competency for virtually all physicians and any other health professionals working with patients who have or are at risk for nutrition-related chronic disease. Scott Kahan, MD, MPH Department of Health Policy and Management, Johns Hopkins Bloomberg School of Public Health, Baltimore, Maryland; and George Washington University School of Medicine, Washington, DC. JoAnn E. Manson, MD, DrPH Department of Medicine, Brigham and Women’s Hospital and Harvard Medical School, Boston, Massachusetts; and Department of Epidemiology, Harvard T. H. Chan School of Public Health, Boston, Massachusetts. completed and submitted the ICMJE Form for Disclosure of Potential Conflicts of Interest and none were reported. 1. Ward BW, Schiller JS, Goodman RA. Multiple chronic conditions among US adults: a 2012 update. Prev Chronic Dis. 2014;11:E62. 2. Office of Disease Prevention and Health Promotion. Healthy People 2020. https://www.healthypeople.gov/2020/data-search/Search-the-Data#srch=nutrition. Accessed January 23, 2017. 3. Kolasa KM, Rickett K. Barriers to providing nutrition counseling cited by physicians. Nutr Clin Pract. 2010;25(5):502-509. 4. Adams KM, Kohlmeier M, Zeisel SH. Nutrition education in U.S. medical schools: latest update of a national survey. Acad Med. 2010;85(9):1537-1542. 5. Batsis JA, Bynum JPW. Uptake of the Centers for Medicare and Medicaid obesity benefit: 2012-2013. Obesity (Silver Spring). 2016;24(9):1983-1988. 6. Kahan S, Cheskin LJ. Obesity and eating behaviors and behavior change. In: Kahan S, Gielen AC, Fagan PJ, Green LW, eds. Health Behavior Change in Populations. Baltimore, MD: Johns Hopkins University Press; 2014:chap 13. 7. Rehm CD, Peñalvo JL, Afshin A, Mozaffarian D. Dietary intake among US adults, 1999-2012.JAMA. 2016;315(23):2542-2553. 8. Paxton AE, Strycker LA, Toobert DJ, Ammerman AS, Glasgow RE. Starting the conversation performance of a brief dietary assessment and intervention tool for health professionals. Am J Prev Med. 2011;40(1):67-71. 9. Mozaffarian D, Capewell S. United Nations’ dietary policies to prevent cardiovascular disease. BMJ. 2011;343:d5747.